Who said you need to spend a fortune to achieve great skin? Stroll through the aisles of Target or Boots and you’ll find plenty of retinol serums, acid exfoliants and non-greasy sunscreens – all the actives you had to pay a fortune for in the past. I picked The Ordinary Retinol 0.5% In Squalane because 0.5% is an intermediate dose most people can use. Lower, it’s for beginners. Higher for pros with resistant skin who have built tolerance to it overtime. So what does retinol do? It’s a form of vitamin A proven to reduce wrinkles. It works in three ways: it boosts collagen production, fights free radicals and speeds up cellular turnover (the skin’s natural exfoliating process). It takes a few weeks to see results, but it’s totally worth it. The moisturising squalane base helps counteracts the drying effects of retinol, too. Related: What Strength Of Retinol Do YOU Need? Neutrogena Beach Defense Sunscreen Lotion Broad Spectrum SPF 30 is a chemical sunscreen. Yep, it uses synthetic filters to block UV rays from reaching your skin and wreaking their destruction. They’re safe too, unless you’re pregnant or have very sensitive skin. Everyone else will love the texture of this sunscreen. It’s so lightweight it sinks into the skin quickly, leaves no cast behind and makes a great base for makeup. Related: Chemical VS Physical Sunscreen: Which One Should You Use? I don’t use the word “need” lightly, you know that. 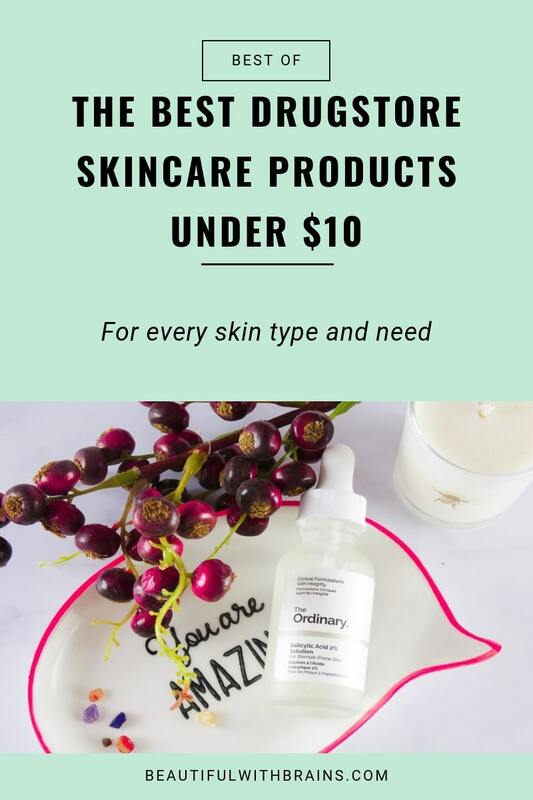 But if you have oily skin, you NEED The Ordinary Niacinamide 10% + Zinc 1% in your life. Niacinamide tackles oily skin in 4 ways: it helps treat acne, soothes the redness that always comes along with pimples, fades away the dark spots they leave behind and shrinks your pores. While it’s at it, it also hydrates skin and strengthens your protective barrier. I know, hard to believe niacinamide can do it all – but we have the science to prove it. What about zinc? This mineral helps regulate oil production, keeping your skin matte for longer. Related: Can Zinc Help Treat Acne? La Roche-Posay Cicaplast Baume B5 Lips is my fave lip balm ever. Last winter, it healed my cracked lips in just a few days when NOTHING else did. Its secret? Shea butter. It creates a barrier on the skin that protects it from cold weather, germs and all the other enemies that dry out your lips + it deeply moisturises too. Panthenol (B5) soothes chapped lips and helps them heal faster, too. If only it had SPF, it’d be perfect. But if you can still use it when the sun ain’t shining. There truly is nothing better for chapped lips. Gone are the days when harsh scrubs were all you could find at the drugstore. Exfoliating acids have now invaded the shelves – and I couldn’t be happier about it. I settled onto The Ordinary Salicylic Acid 2% Solution because everyone can use salicylic acid, including sensitive skin. It has anti-inflammatory properties that soothe redness and irritation. But it truly shines (in a good way!) when dealing with oily skin. Salicylic acid is oil-soluble, so it’s able to penetrate deep into the pores and remove all the crap that’s clogging them up and giving you blackheads and pimples. Need to get rid of a pimple quickly? It’s a job for Clean & Clear Persa-Gel 10. It contains benzoyl peroxide, an anti-bacterial that kills P. Acnes, the bacteria that’s giving you acne. This baby is one of the most powerful weapons against acne – and one of the harshest. It’s very drying, so use it only as a last resort – and ONLY on pimples. Related: Benzoyl Peroxide: Friend Or For For Your Skin? What do you think are the best drugstore skincare products under $10? Share your picks in the comments below.